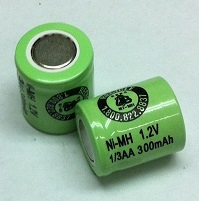 EP300AA : 1.2 volt 300mAh 1/3AA rechargeable Ni-MH battery cell. Size: 0.625" tall, 0.56" diameter. Weight: approx 1/3 ounce. Available Plain, or with Solder Tabs (one on top, one on bottom - for assembly) for $ 0.25 extra per cell. Pricing is for one battery cell; picture shows 2 views of the battery cell. New Pricing effective July 2018. 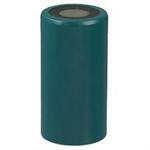 C Spacer : C-size battery casing - load with AA cell. C Spacer : C-size holder - load 1 x AA into it, and use in place of a C cell. 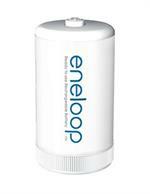 Can insert rechargeable AA or Alkaline AA inside. D Spacer : D-size holder, load with 1 x AA battery, and use in place of a D cell. 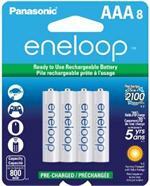 Can insert rechargeable AA or Alkaline AA inside. 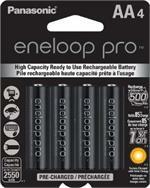 EP700AAH: 1.2 volt 700mAh rechargeable NiMH battery cell. Size: 1.1" tall, 0.56" diameter. Known as 2/3AA size. Available with or without Solder Tabs. 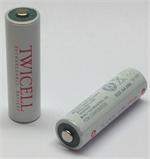 HR-3U-2500 : 1.2 volt 2500mAh High-capacity rechargeable AA Ni-MH battery cells. Choose button top or w/ solder tabs ($ 0.25 extra per cell). Premium quality cells. HR-AAU: FDK (Sanyo) brand 1.2 volt 1650mAh AA rechargeable Nickel Hydride flat-top battery cell. Solder tabs optional & recommended - $ 0.25 extra per cell). These flat-top Ni-MH cells are typically used for assembly purposes. EP-1600A : 1.2v 1600mAh HIGH OUTPUT 2/3A NiMH battery cell, 1.1" tall x 0.67" diam. 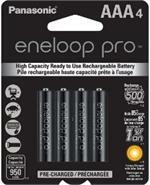 EP-1600A : 1.2 volt 1600mAh HIGH OUTPUT rechargeable NiMH battery cell. 2/3 A size; 1.1" tall x 0.67" diam. Output rated to 30C. Flat-top style; choose Plain or with Solder Tabs ($0.25 extra per cell). 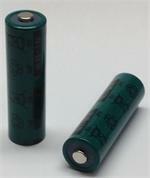 HR-3U-2700 : 1.2volt 2700mAh rechargeable Ni-MH batteries. Highest capacity, highest quality AA cells. Choose Plain (button Top), or with Solder Tabs (for assembly - $ 0.25 extra per cell). 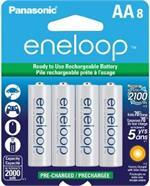 HR-AUL : SANYO 1.2 volt 2150mAh 4/5A-size rechargeable Nickel Metal Hydride battery. Size: 1.69" tall x 0.67" diameter. Flat-top style; commonly used for assembly & rebuilding. AP-850AAAH : 1.2 volt 850mAh 5/4 AAA Ni-MH battery cell. 2" tall. Fits Talkabout phones, R/C applications, etc. 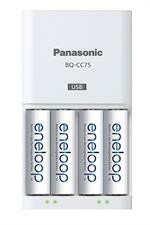 HR-AU: FDK (Sanyo) brand 1.2V 2700mAh rechargeable Ni-MH A-size battery cell. Same length as a AA cell, but slightly larger in diameter. Commonly used for assembly & rebuilding. Choose plain (flat top), or add Solder Tabs ($ 0.25 extra per cell). 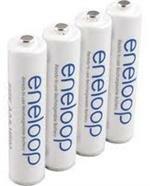 EP-4200SC : 1.2 volt 4200mAh rechargeable NiMH HIGH OUTPUT Sub-C battery cells. Rated to 30C. Choose Plain (no Tabs) or with Solder Tabs ($0.25 extra per cell). 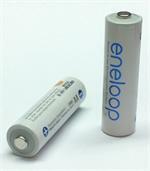 EP-5000SC: 1.2 volt 5000mAh rechargeable NiMH Sub-C size cell. Choose plain or add Solder Tabs for $0.25 per cell. HR-4/3AU: FDK-brand 1.2 volt 4000mAh rechargeable Nickel Hydride battery cell. 4/3A size, flat-top style. Cell is 2.5" tall and 0.67" diameter. Add Solder Tabs for $0.25 extra per cell. 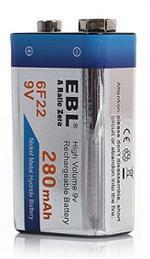 HR-SCU: FDK-SANYO brand 1.2 volt 3000mAh rechargeable Ni-MH Sub-C flat-top battery cell. Available plain, or with Solder tabs at each end. HR-DU : 1.2v 10,000mAh rechargeable NiMH D size battery - SALE ! HR-DU : 1.2 volt 10,000mAh rechargeable "D" size Ni-MH battery cell. Charger & AA PREMIUM Package deal: 4 Best AA rechargeable Ni-MH cells (Sanyo brand 2700mAh) & Smart-Fast Charger (V-1000). 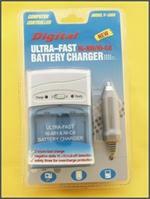 Charge batteries from Wall outlet OR in a Vehicle (with the included Wall Transformer & 12VDC Power cable). PREMIUM VALUE Charger & AA pkg: V-1000 Smart Charger + 4 x AA Twicell 2500mAh AA Ni-MH cells. Provides ultimate performance for your AA-powered digital devices. 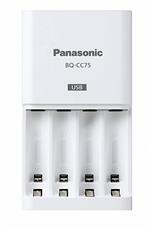 The V-1000 is a Fast-Smart Charger for 2 or 4 AA or AAA Ni-MH or Ni-Cd batteries.